Congress President Rahul Gandhi on 23 December once again offered prayers at the historic Somnath Temple. Rahul was accorded a warm welcome by the Congress workers as he reached the temple who garlanded him. 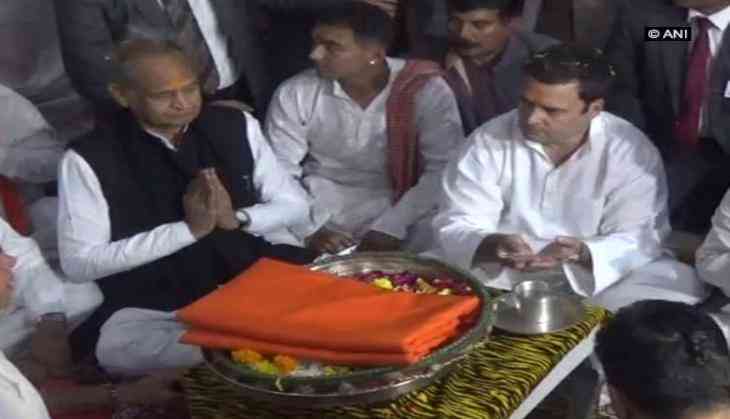 He along with Congress General Secretary in-charge Ashok Gehlot and Gujarat Congress President Bharatsinh Solanki performed puja at the temple. During Rahul's last visit to Somnath Temple on November 29, a controversy erupted after his name along with senior Congress leader Ahmed Patel was allegedly mentioned as non-Hindus in the visitor book of the temple. Sensing the damage the news could do in the majority Hindu state, Gujarat, during the elections, the Congress came up with a claim that Rahul is a janeu-dhari (the one who wears Brahminical thread) Hindu. The Congress also issued a clarification in this regard on Twitter. "Clarification: There is only one visitor's book at Somnath Temple that was signed by Congress VP Rahul Gandhi. Any other image being circulated is fabricated. Desperate times call for desperate measures?" tweeted the Congress. While campaigning for the Congress in the Gujarat assembly elections, Rahul visited many temples. The BJP targeted Rahul over his temple visits and termed it as a political move to woo Hindu votes. On December 21, Uttar Pradesh Chief Minister Yogi Adityanath said in Totana that "the Gujarat election has done two things: it has taught former prime minister Manmohan Singh to speak and Rahul Gandhi to visit temples." Rahul's today's visit to Somnath Temple comes at a time when there are no elections due in Gujarat in near future and it is being seen as a move to thwart the BJP's campaign to term him as a seeker of Hindu votes. Buoyed by its performance in Gujarat Assembly polls, the Congress' Gujarat unit organised 'Chintan Shivir' in Mehsana on December 20-21 to discuss the results and prepare a roadmap for 2019 Lok Sabha polls. The Congress won 77 seats in 182-member Gujarat Assembly. The BJP won 99 seats to form next government in the state. Later in the day, Rahul is slated to meet the participants of the shivir in Ahmedabad. After getting a brief about the outcome and suggestions of the shivir, the Congress president will speak to party cadre.